1. 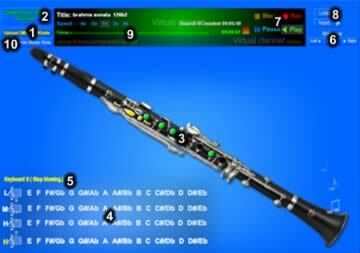 Upload files to midi files of the clarinet. 2. 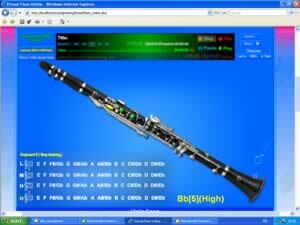 Download midi file that plays clarinet. Or recording it. 3. The position of the press. 4. Play a clarinet sound of music notes. 5. Stop the sound of a blowing. 7. Buttons for stop, play and record. 8. Button for students. To play the clarinet. 9. The position of the time of the song. Which can move the time. Specifies. Show or no show. Notes of the song on the clarinet.